McDonald’s is testing its new mobile ordering app in Salt Lake City, Utah, and Austin, Texas. If the testing is successful, the app will be made available U.S.-wide. The app was created to make ordering fast food even faster and easier for McDonald’s customers – especially the younger demographic who are increasingly using their smartphones as credit cards. 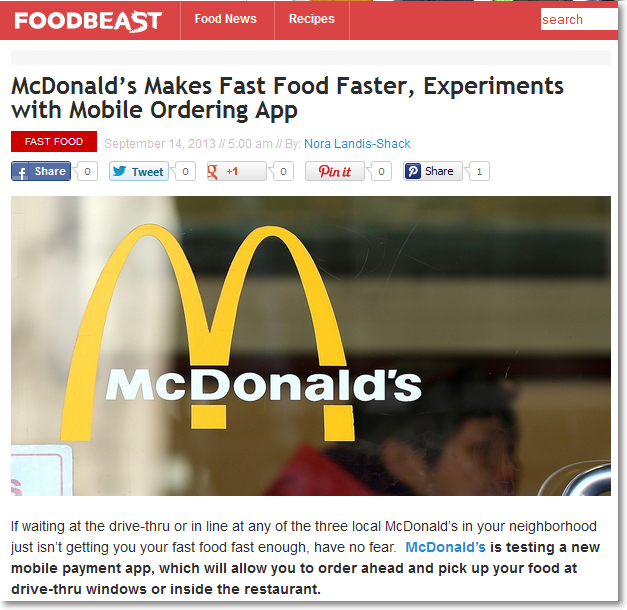 While McDonald’s already has a mobile app for locating its restaurants, providing nutritional facts and announcing job opportunities, it lacked a mobile ordering and payment component that’s offered by Burger King and Chipotle for some time now. Burger King’s app offers free delivery if you order a minimum of $10. 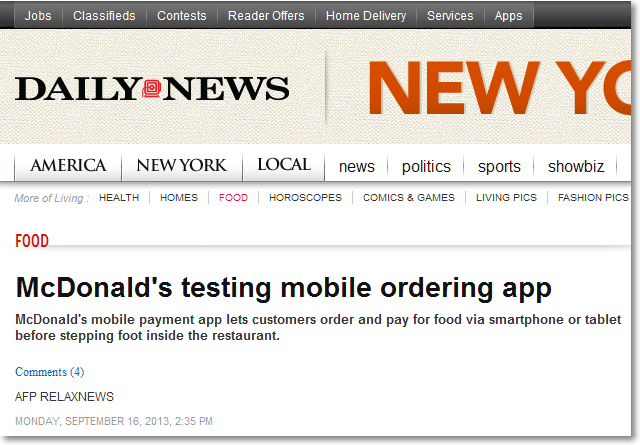 McDonald’s app counters with special offers and promos and a loyalty program. In the idea of disruptive innovations, it is thought that there is a longer gap between early adopters taking up the innovation and the early majority. eBay probably belongs to the innovator or early adopter group. Back in February, we mentioned eBay CEO John Donahoe saying they “bet on mobile early (and heavily), even if most people didn’t see the mobile revolution coming.” In 2008, eBay was one of the first to offer a mobile ordering app at the Apple App Store – a shrewd, early move that’s expected to get them at least $10 billion in commerce this year. 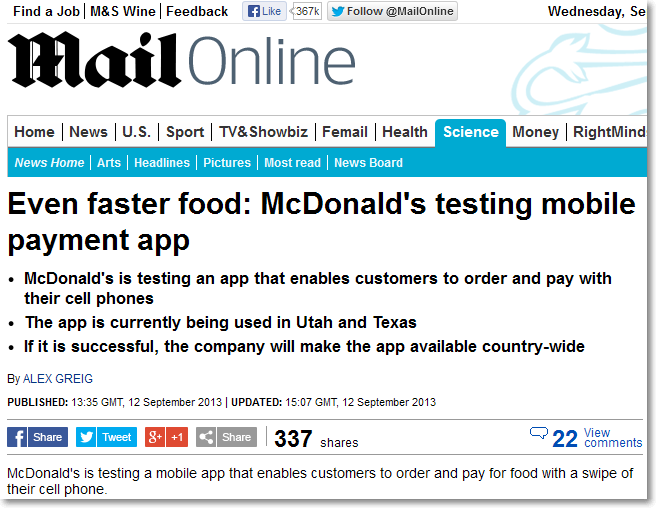 McDonald’s mobile app testing could belong either to the early majority or late majority group, because it took time to offer mobile ordering and payment – five years (2008 to 2013) is practically a generation in the digital world. 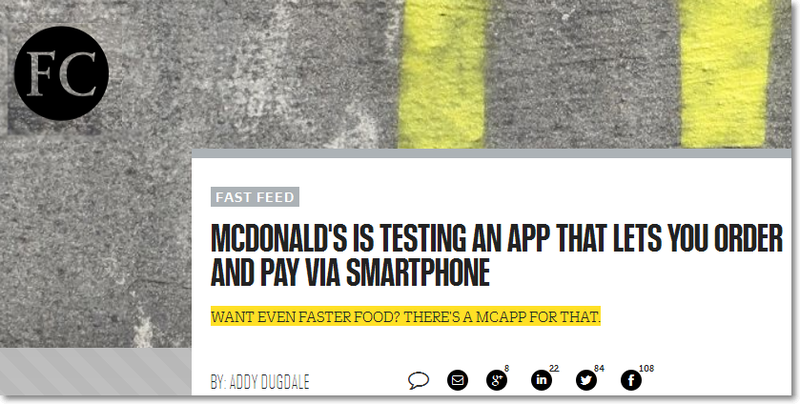 However, if this article by Lauren Johnson at Mobile Commerce Daily is typical for those trying out the experience, McDonald’s mobile ordering and payment app still has a lot of tweaking to go through before it becomes ready for primetime. And then there are the laggards. Pioneering disruptive innovation theorist Clayton Christensen argues that, at first, big established companies ignore an emerging disruptive innovation because there are no big profits to be gained initially from it, until such a time that the market disruption becomes so great a threat that the established companies have to follow up with a ‘me too’ offering in order to survive. This is where McDonald’s is right now. It has to come up with mobile ordering and payment like what its smaller competitors are doing. 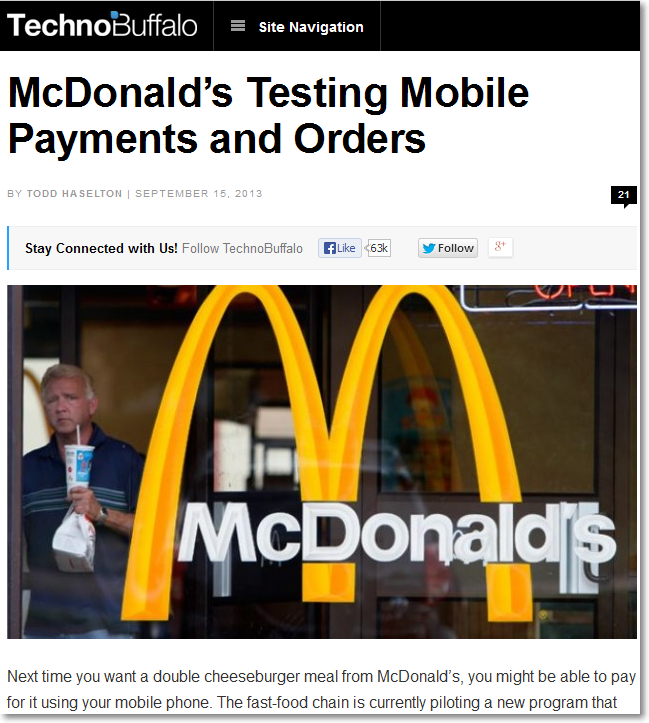 With U.S. profits slumping, McDonald’s cannot afford not to go mobile. Follow the money. And go where people are increasingly hanging out: online. 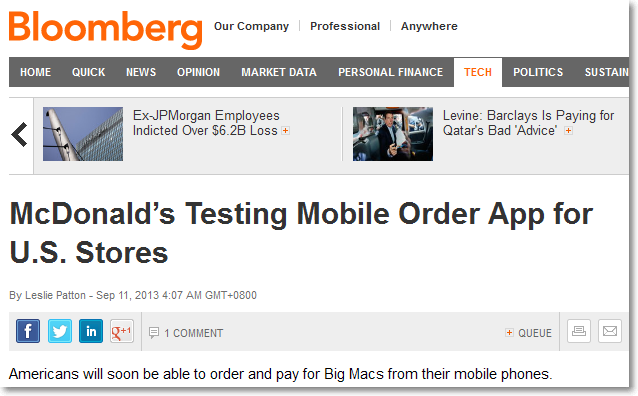 If you’re an ordinary consumer, expect this move by McDonald’s to make ordering your favorite Mac sandwich a breeze. If you are a decision maker for a company in an industry that can take advantage of mobile ordering and payment, look to what your competitors are doing. Depending on your industry, you might still get to be among the early adopters. Meanwhile, the guys at Phandroid’s Mobile Roar Podcast #12 have posted a parody (16:13-16:43 of the video) of Apple designer Jony Ive ordering a Big Mac: http://youtu.be/pxW7CnNsmZ0 . Have fun.